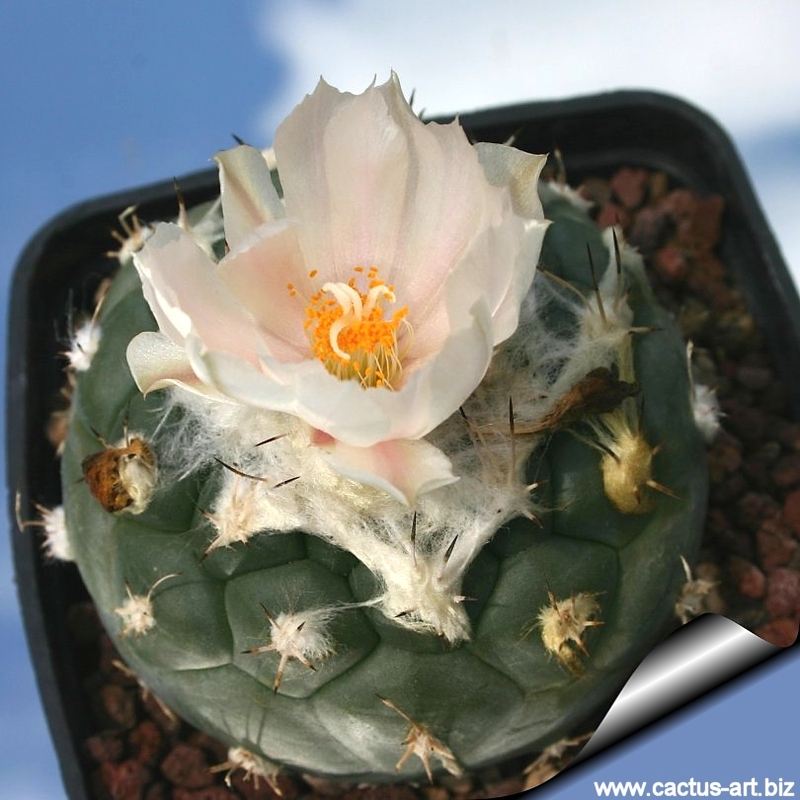 This is one of the most interesting Turbinicarpus, with very large flowers. 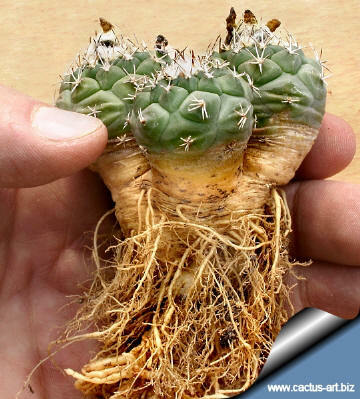 Description: Dwarfed usually solitary, flattened globose cactus (but sometimes clusters with age) This turbinicarpus, one of the first discovered, almost a century ago, has remained little known for a long time, due to the difficulty, for a long period, to find it in the wild. 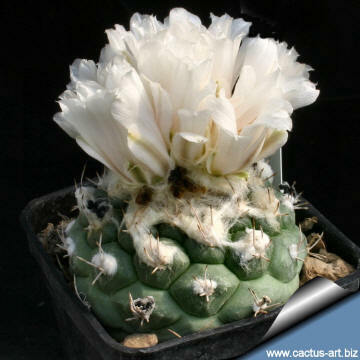 It specific name remember us that it resembles the genus Lophophora. Stem: Greyish-green or bluish-green stem that doesn’t exceed the diameter of (3) 4.5-5 (10 cm) by 4.5 high. Tubercles: Organized in 12 spirals. Areoles: Very pronounced, woolly, later naked. With the age, the areoles become woollier and can get to completely transform the aspect of the plant. Spines: 3 to 5 spreading, thin, ± rigid, (even though there are populations with 2 or even 6 spines per areole), mostly 5-8 mm long, black-tipped brownish-grey. Flower: Usually rather large and white with a pinkish tinge, 3.5-5 cm in diameter. They are developed from the new very woolly areoles in the apex of the plant. 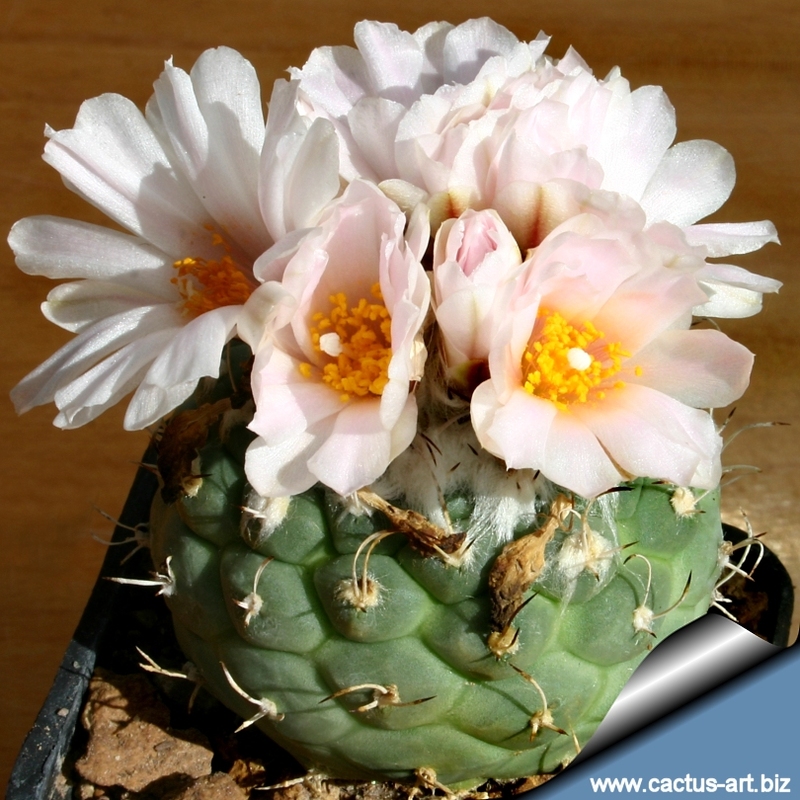 It has scarcely irritable stamens, straight but thin, with a low insertion of the primary filaments, while in all the other species, (including the Gymnocactus and Viereckii Series) the insertion is high and the stamens are very irritable. This indicates that this species has some primitive characters. Anthers yellow/orange. Stigmas white. T. lophophoroides has a very swollen and delicate rootstock connected to the stem by a thick (not constricted) neck. The white crown will offset the flowers. Cultivation: It’s a plant adapted to a specific type of soil and quite prone to rot especially after the first flowering. A 10 -30% of natural gypsum could be added to a very well drained soil. Watering should be rather infrequent, but abundant, so that the soil becomes completely soaked. 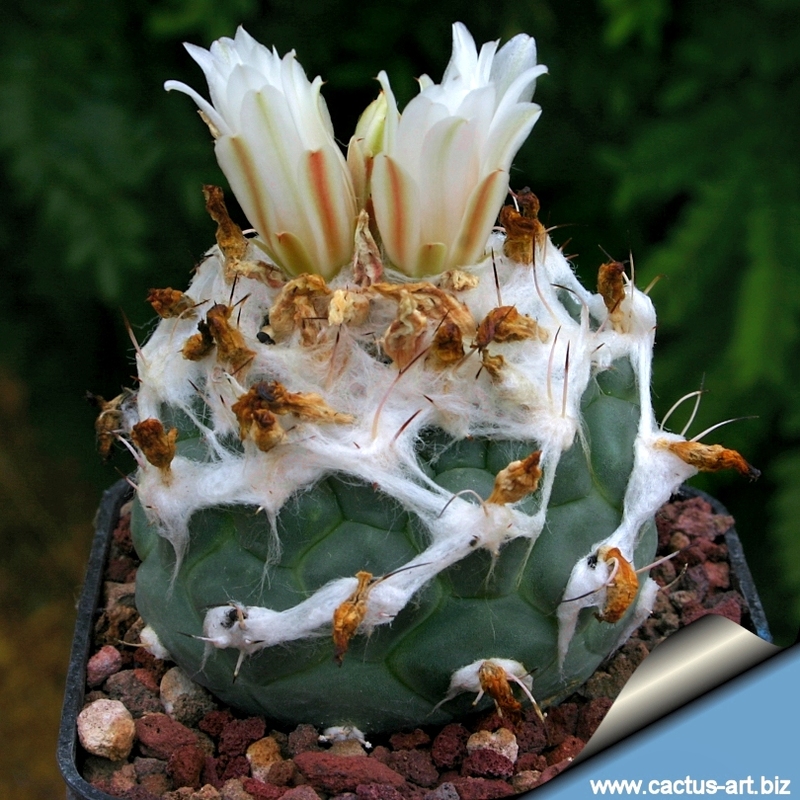 Careful watering away from the body of the plant will allow the areoles to keep their wool. The fact that the plant retracts into the soil and assume a grey-green colouring between watering, is perfectly natural and doesn’t cause any damage. Keep dry in winter or when night temperatures remain below 10° C, it is hardy to -4°C for a short period. Assure a good ventilation. Exposures: Full sun where it obtains a natural-looking flat, or part sun. 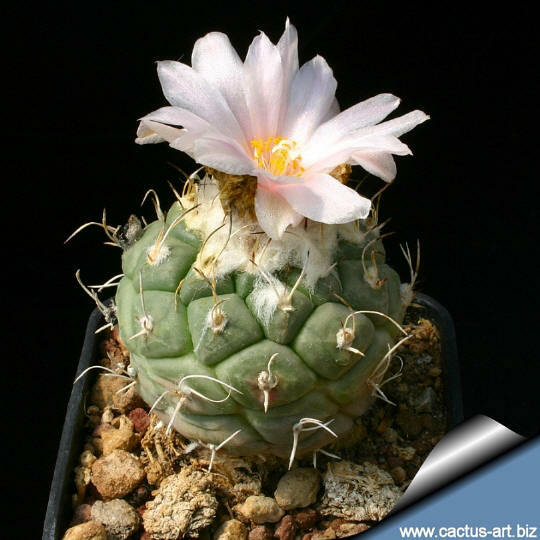 Origin: Mexico, San Louis de Potosì, situated between the counties of Ciudad del Maiz on the north, and Cerritos-Villa Juarez on the west and Rio Verde on the south, at an altitude between 800 and 1150 m above sea level. Ecology and habitat: It is found in several populations varying from a few individuals up to several thousands of specimens in sparse grassland with herbs, or very open woodland and open land with several opuntias, the plants grow not hidden in crevices on sloping terrains, but are located on deep, salty plains with mostly gypsum soil, that are seasonally flooded with great concentration of salts and pH that can in some areas exceed 9. Plant retract heavily into the ground during the dry season, so much that they can disappear until the following rains don’t bring them to their original dimension and make them reappear on the surface. 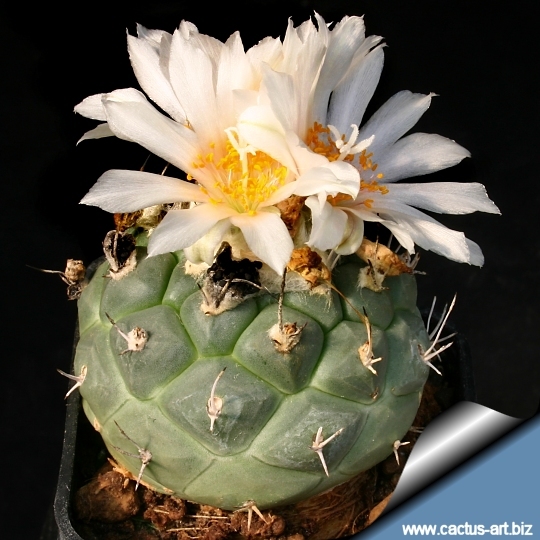 The type of environment where this taxon lives, allows insects to visit many flowers, since the plants are not hidden in crevices on sloping terrains and the flowers are very visible, so the essential mechanisms used by the other Turbinicarpus sensu stricto species are not necessary. Also, the T. lophophoroides populations, are, if left undisturbed, relatively prolific, in fact they are not linked to a particularly impervious and hostile environment (from the water availability point of view), like that of the majority of the other turbinicarpi, in fact T. lophophoroides is found in numerous populations located on deep and horizontal ground. in Kaktus-ABC, 356 (Backeberg & F. Knuth, 1935). in Saguaroland Bull. 1956 :119 (Bravo-Helia & Marshall, 1956). in Bradleya 4 : 1-28 (Anderson, 1986). in Acta Mus. Richnov. 5 (1) : 21 (1998).